Fencing is the only sure-fired way to keep wild and domestic animals out of a prized garden long term. Although it can be expensive for large animals such as deer, it may be the only way to protect your yard from costly damage. Here are some points to keep in mind when planning to build a wildlife fence. Check local ordinances on building fences. Large fences may block desired views. Polypropylene fencing is less obtrusive than solid fencing, but provides protection only from certain animals. Electric fences are more expensive and need maintenance, but they make less of an impact on your view and can be more effective than solid fences. Electric fences work best if animals know they are "hot". Smear peanut butter on the fence as soon as you put it up to entice animals to get shocked. They'll be less likely to test the fence again. Keep vegetation from touching the fence. It will reduce its charge or ground it out. Build the fence to fit the animal. Below is a list of animals with design tips to foil their wiles. Deer are probably at the top of the list of animals home owners want to fence out. Since deer can jump, the fence needs to be constructed high and at an angle to deter them. 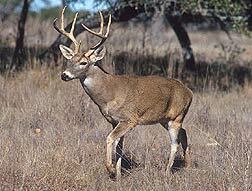 There are many design variations for deer barriers available from game wardens. One effective option is an 8- to 10-foot-tall fence slanted at a 45 degree angle toward the direction from which deer are most likely to come (for an illustration, click here). It will make them think twice about jumping. Keep the fence snug to the ground, since deer can also wiggle under fences. Electric fences baited with peanut butter and solid fences that block the view to a food source also work well. Build a wire mesh fence 3 feet high anchored with sturdy posts. Cats probably won't climb over, and most dogs can't knock it over. Bend the base of the fence outward to form a 2-foot-wide apron along the ground to discourage dogs from digging under it. Exclude rabbits with a 2-foot-tall chicken wire fence that has 1-inch-diameter holes. To prevent them from digging under, curve the bottom of the fence 90 degrees to create an apron a foot or so wide, and bury it several inches deep. Like raccoons and opossums, woodchucks are good climbers, so leave the top 18 inches of fence unattached, or string electric wire across the top to discourage these pests. The 4-foot-tall fence should also have a 2-foot-wide apron buried a few inches below the soil to stop the pests from burrowing under the fence. Electric fencing placed a few inches outside a wire fence also helps. These subterranean travelers have the advantage of being out of sight most of the time, and can do their dirty work of munching your plants undetected. In winter, they move beneath the snow and gnaw the bark off young tree trunks, and you often don't discover the damage until spring. If your garden is plagued by any of these tunneling creatures, you can create cages or baskets to protect prized plants. Dig a 2- to 3-foot-deep hole in the planting area and line the sides and bottom of the bed with wire mesh. Replace the soil and plant your garden. Protect tree trunks with wire mesh guards placed a few inches below the soil line and 2 feet up the trunk. Check the guards in the spring and fall, adjusting them to make room for tree growth and to be sure they are securely fastened. These animals dig and climb, so this fence needs a floppy top and a barrier to digging. A 4-foot fence with the top 18 inches unattached will fall back on the climbing creature, keeping it from scaling the fence. To prevent the pests from tunneling under, curve the bottom of the fence 90 degrees to create a 2-foot-wide apron, and bury it several inches deep. Placing and electric wire on top of a 3- to 4- foot-tall fence will also work. Raccoons and opossum don't like material that clings to their feet, so draping bird netting on the ground outside of the fence and keeping the grass mowed may also deter them. Start with a perimeter electric fence. Add a sheep fence with another electric fence wire strung 8 inches off the ground and a few inches in front of the sheep fence. Since coyotes can jump, add an electric wire on top of the sheep fence as well. Bears can easily maul most fences, but they can be discouraged from entering an area they haven't explored yet. Since they don't like walking over chicken wire, lay a 3- to 4-foot-wide swath of it on the ground and secure it well. Keep the area mowed. Electric fencing is effective if bears encounter the hot fence before they know about the food source on the other side.